The fact that I was unaware of Punishment 18 Records probably made the label make me realize my mistake by sending me several of its new releases. One of them is the brand new album by ANCIENT DOME, a band I had the chance to get to know last year by its 2005 self titled demo. Let's see how much has the band progressed since then. The Italian metallers managed to sign a contract with the also Italian Punishment 18 Records for the release of their first ever full-length album. Entitled simply Human Key, the album is the band's first attempt to show its skills on a full-length release, which means that the jokes are over. It is much easier to entertain someone with 3-4 songs in a promo/demo CD, but approximately 44 minutes of Thrash Metal are not easy for everyone to handle. Yeah, you heard me right the first time. 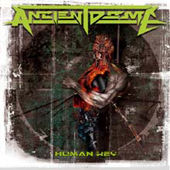 ANCIENT DOME is a Thrash Metal band. I prefer them than the average Italian Black, Gothic or Power Metal band. And let me remind you that NECRODEATH, the Italian Thrash/Black Metal act has been a favorite of mine for many years. So, ANCIENT DOME's music kind of reminded me of HEATHEN, that awesome melodic Thrash Metal band from the US. Of course the Italians feature more aggressive vocals (as most of the Thrash bands do nowadays) and are a bit more aggressive musically.